Irene Margaret Hansen, the daughter of Rasmus and Alma (Peters) Nielsen, was born November 13, 1925, at her parents’ home near Shelby, Iowa and died January 17, 2019, at the Friendship Home in Audubon, Iowa at the age of 93 years, 2 months, and 4 days. Irene was baptized and confirmed at the Elk Horn Lutheran Church in Elk Horn, Iowa. She attended school in Walnut, Iowa and then worked as a hired girl for several area families. On February 22, 1946, she was united in marriage to Emmert A. Hansen at the Elk Horn Lutheran Church in Elk Horn, Iowa. They were blessed with six children Linda, Carol, Gloria, Debbie, Kim, and Mitch. They farmed near Viola, Iowa where Irene helped Emmert grow row crops and raise livestock. She also had a vegetable garden where she enjoyed growing, harvesting, and then canning the produce. In 1969 they moved north of Ross, Iowa where Emmert operated his trucking business and Irene was employed at Kearney Pharmacy in Audubon. Irene worked at the Pharmacy for several years then worked as a cashier for Super Valu for a few years then was employed at the Friendship Home in Audubon as a dietary aide. Emmert died September 24, 1986. Irene continued to work at the Friendship Home until she retired at age 75 after working there for over 25 years. 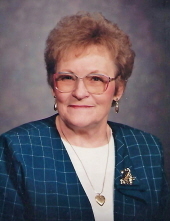 Irene was a member of Our Saviour’s Lutheran Church in Audubon and a lifetime member of the V.F.W. Auxiliary. She enjoyed cooking and baking with her specialties being cinnamon rolls and potato salad. She was a 4-H Leader when the children were growing up. Irene enjoyed quilting and visiting with friends and family. But most of all she enjoyed her children, grandchildren, great grandchildren, and her great-great grandchildren. Preceding her in death was her husband Emmert A. Hansen; her daughter Gloria Clausen; her son-in-law Don Bybee; her parents; her brothers Elmer and wife Pat Nielsen, Virgil Nielsen, Marvin Nielsen, and Donald Nielsen; her sisters Alice and husband Harold Winther, Jean Loudenslager, and Donna Byriel; and her bothers-in-law Jeff Roberts and John Louis Steenhusen. Survivors include her children Linda and husband Eugene Mennenoh of Audubon, Iowa, Carol and husband Lanny Clausen of Madrid, Iowa, Debbie Bybee of Audubon, Iowa, Kim and husband Doug Peterson of Granger, Iowa, and Mitch and wife Michelle Hansen of Dallas Center, Iowa; her grandchildren Lisa and husband Rex Daisy of Dakota City, Iowa, Dan and wife Kelly Mennenoh of Ross, Iowa, Randy Koenig and friend Tracy Burns of Osceola, Iowa, Kristi and husband Sam Melton of Lubbock, Texas, Angie Counsell of Mason City, Iowa, Darren Clausen and friend Sarah Christian of Monroe, Iowa, Erin and husband Campbell Faulkner of Houston, Texas, Adam and wife Lindsey Peterson of West Branch, Iowa, Alex Hansen and friend Katie Reed of Audubon, Iowa, and Spencer Hansen of Ames, Iowa; 8 great grandchildren; 4 great-great grandchildren; her sisters Mary Steenhusen of Irwin, Iowa and Janelle Roberts of Exira, Iowa; her sisters-in-law Laurel Nielsen and Dorothy Hansen both of Audubon, Iowa, and Barb Reinitz of Washington State; her brothers-in-law Fred Loudenslager of Indianola, Iowa and Glen Byriel of Boone, Iowa; nieces, nephews, other relatives and friends. The Celebration of Life Memorial Service will be conducted by Pastor Adam Smith on Wednesday morning, January 23, 2019, at 11:00 a.m. at Our Saviour’s Lutheran Church in Audubon, Iowa. Distribution of the cremains will be at a later date. The honorary casket bearers will be Lisa Daisy, Kristi Melton, Angie Counsell, Erin Faulkner, Kaitlyn Daisy, Shelbie Akers, Cole Mennenoh, Wade Mennenoh, Makayla Stephens, Taven Counsell, Treven Counsell, Finnley Peterson. The casket bearers will be Dan Mennenoh, Randy Koenig, Darren Clausen, Adam Peterson, Alex Hansen, and Spencer Hansen. The family will meet with friends Wednesday morning, January 23, 2019, from 10:00 a.m. until the time of the service at Our Saviour’s Lutheran Church in Audubon, Iowa. The family prefers gifts in memoriam which will be distributed as to the family wishes. To plant a tree in memory of Irene Margaret Hansen, please visit our Tribute Store. "Email Address" would like to share the life celebration of Irene Margaret Hansen. Click on the "link" to go to share a favorite memory or leave a condolence message for the family.